So-called drought-resistant plants are, by definition, tolerant of low-water conditions. But while the definition is straightforward enough, we find that it's not so easy to implement a plan that will get our landscapes through periods without rainfall (in the absence of artificial irrigation). That's because, in practice, there are numerous factors that have a say regarding whether or not a plant will receive adequate water. For example, what type of soil do you have? Something that qualifies as a "drought-resistant plant" in a wonderfully loamy soil may struggle during a dry spell if it's growing in a sandy soil (through which water pours quickly, as through a sieve). Then there's the issue of competition for resources. The most extreme example is encountered when we plant under trees. Only stubbornly tough plants can compete successfully with massive trees for water. But on a less extreme level, even various types of weeds can pose a challenge to landscaping specimens during dry periods, siphoning off much-needed water. Thankfully, using garden mulch correctly can mitigate some of the above challenges. Mulch shields the ground from the pounding sun, helping to keep it from drying out. It also suppresses weeds, thereby reducing competition for water. But even after mulch breaks down, it continues to work hard for you. As it decomposes, organic mulch adds humus to the soil, promoting water-retention. Always pay attention to sunshine requirements and/or tolerance when planting. You may think of full-sun plants when you hear mention of drought-resistant plants, but there are also suitable plants for dry shade. Moreover, not all sun-lovers tolerate excessive dryness (and there are varying degrees of such toleration). Obviously, geographic location will also have a say in your plant selection. Knowing your growing zone is only the beginning. Within those zones, some regions are drier than others. In the American Southwest, one may be forced to grow a plant such as prickly pear cactus, whereas in the North it is often grown by choice, as a novelty (it is extremely hardy for a cactus). The resources below are geared to zones 4-8, generally speaking, although in some cases I offer examples of plants that will work in hotter climates. Vegetation that tolerates dry soil includes stalwarts such as cacti and succulents, as well as native plants. The latter have adapted to your local climate over the ages, so they should work well as drought-resistant plants if you can mimic their natural habitat (soil type, amount of sunshine or shade, etc.). But part of the purpose of the resources linked to below is to broaden your choices, so as to include less-obvious picks. Because, let's face it: not everyone will like the look of a landscape planted purely with cacti and succulents, although new cultivars such as 'Chocolate Drop' sedum may generate significant excitement. And sometimes natives simply don't offer enough color choices for a particular season of the year. Click the links below to research your options and start planning a xeriscape that is not only practical but also good-looking. We often take trees for granted, figuring that these gentle giants can fend for themselves. But before a specimen becomes established, you very much do have to worry about the impact dry conditions will have on it. Thus the need to include a selection of suitable trees in my lists of drought-resistant plants. 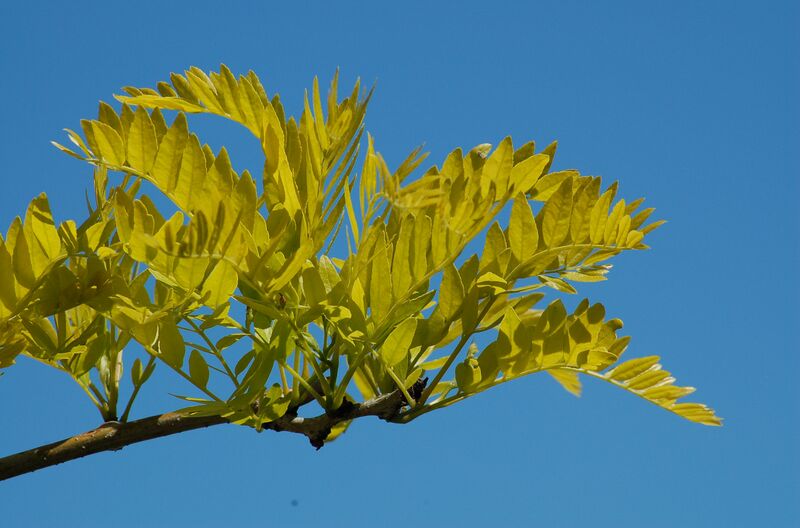 Staying with the theme of not sacrificing appearance when seeking drought-resistant plants, in this resource I have chosen trees that offer your landscaping a number of aesthetic benefits. Whether you crave colorful displays of spring flowers, great fall color or some other feature, this information will help you find the right tree for your yard. The tree pictured on your left, for example, is Sunburst honeylocust, which has pretty spring leaves and is one of the least messy trees. As with all the picks on this page, click the photo to access the list. I spoke above of natives always being an option when seeking drought-resistant plants. In eastern North America, arrowwood viburnum would be an example. From its white spring flowers to its pretty leaves and berries in autumn, this bush will furnish visual interest for you for much of the year as you stroll through your woodland garden. 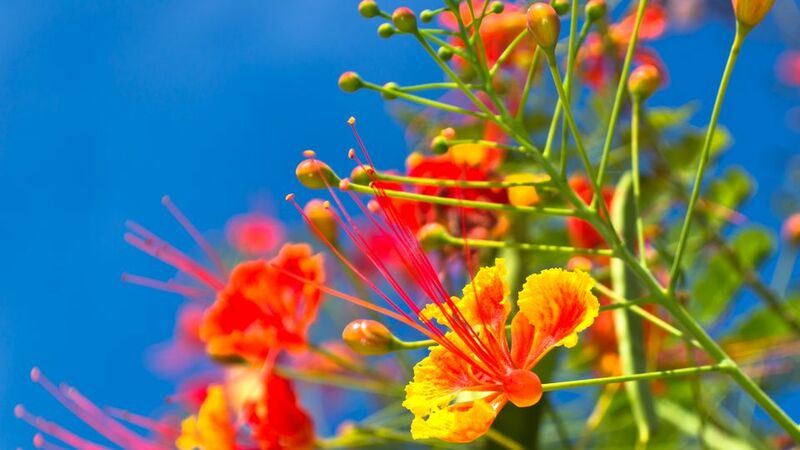 But there are plenty of other shrubs that are examples of drought-resistant plants, as I detail in my full article, including a plant pictured on your left that is popular in places like California and Arizona: Mexican bird of paradise. When we turn to ground covers that can be classified as drought-resistant plants, we're faced with some tough choices. Many are invasive or, at the very least, aggressive. This fact, however, should not take us by surprise. Think of what job the classic "ground cover" is grown to perform: to spread out over time and cover a patch of ground that would otherwise be bare (until the weeds take root). It should not shock us, then, that some of them simply perform this job too well (from our perspective). In the list linked to at left, I do warn you about some popular ground covers that are rated as invasive in North America. An aggressive plant that you might also hesitate to grow (in spite of its good qualities) is Virginia creeper (technically, it's not considered "invasive" in North America because it's a native there). Virginia creeper will climb if given any support to grow up (trees, fences, etc. ), but in the absence of any such support it can function as a ground cover. A much better-behaved ground cover that does not require a lot of water is creeping thyme. Candytuft (picture at left) is one of the "good" ground covers that make my list. In the photo (left), I show an example of an ornamental grass that is a drought-resistant plant. It's called "zebra grass." You can learn more about this and similar ornamental grasses by using the link placed above the picture. Ornamental grasses are very useful in landscaping. Many not only exhibit a tolerance for dry weather but are also deer-tolerant. In terms of plant texture and form, they furnish the landscape designer with handy tools for injecting contrast into landscaping. Perennials associated with the Mediterranean tend to be drought-resistant plants. Also well represented in this group are plants with silver leaves and herb plants. Lavender (image at left) falls into all three categories. But there are plenty of other choices available. For example, I grow black-eyed susan in a corner of my landscaping that does not receive much water. Most years, it does just fine. This Susan may have a black eye, but she didn't get it from drought. Click the image to access my list and learn about more choices.